"What kind of birth control do you use?" Back up the bus. While driving to the appointment I listened to an interview on Catholic radio regarding "fertility awareness methods." Ha, I thought, so that's what they're calling NFP now. Then it struck me. "Fertility awareness methods." That's absolutely brilliant. Pro-lifers have been outwitted at the semantics game for years now--not because we are an unintelligent lot or have outdated arguments. Quite the opposite. Pro-lifers have truth and science on our side. But truth hurts. It lessens the sting to consider abortion as removing the "products of conception," "terminating a pregnancy," a "gentle emptying of your uterus." Sounds like a day at the spa. But I digress. Maybe at one time, "natural family planning" had a modern ring to it, as every grocery store has a "family planning" section chock-full of condoms and pregnancy tests. Maybe tacking "natural" onto "family planning" was once a phrase that sparked some interest among those who frequent that aisle. But now, it would seem that NFP is the derided younger sibling of the rhythm method. Tell the secular world you use NFP, and they ask if you and your 11 offspring can afford a roof over your heads. Is Kindara (free, but only available on iPhones with iOS 7.0) a NFP app? No no. It's a fertility awareness method app. I see apps like Kindara as having a tremendous benefit to folks with no exposure to the tried-and-true NFP methods like Billings and Creighton. But they must come with a warning. While a basic knowledge of ovulation is enough to help many women conceive a baby, it is often this knowledge of their bodies through accurate charting (interpreted by a NaPro-trained doctor) that uncovers the cause of infertility--endometriosis, polycystic ovarian disease, low progesterone, etc. And for that, you need a doctor (or at least a certified instructor who can help find one). 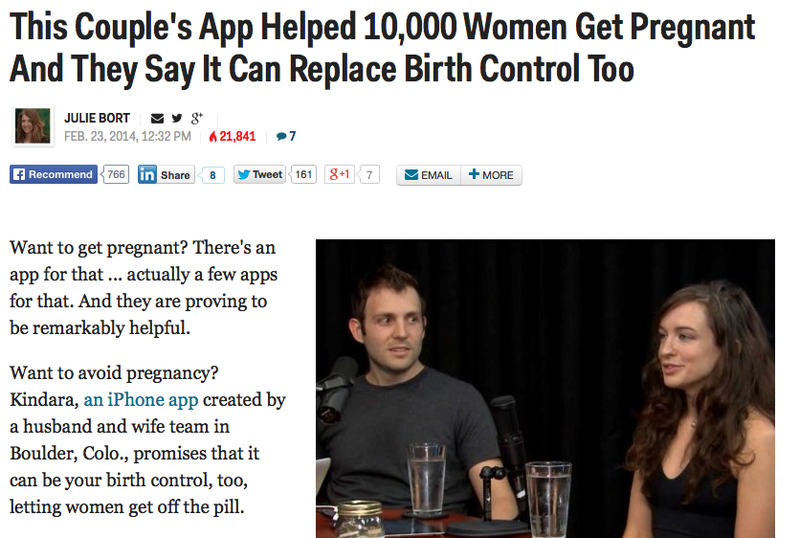 So there's the question: Does fertility awareness popularity through apps and other informal sources of learning create a net gain for the method, since it unchains women from carcinogenic, hormonal, and abortifacient birth control? Or does it set up a net loss for the method, since it will most likely "fail" some women who have more complex cycles than can be charted through an app? News of those "fails" will more than likely make their way to news sources who are unfriendly to the idea of NFP, or more accurately, who will defend the pill to the bitter end. I cringe writing "fail" since that would generally indicate a pregnancy when a baby isn't desired, and that indeed would be a fun story for Slate and the like. However, I tend to say the former outweighs the latter. If any couples ditch the pill, conceive children or better understand their bodies through a fertility awareness app, then praise be to God for it. And in time, perhaps couples who begin using Kindara will eventually gravitate to formally learning established NFP methods. And to circle back: What did I tell my nurse practitioner when she asked what birth control I use? Well, I use a fertility awareness method. Naturally. That's so funny .. I have not yet heard the phrase "fertility awareness method". While learning about NFP during marriage prep, I was never bothered by it being called that! Great post and I have to agree with you, if this app helps inform couples to some extent about this process and gets them off of birth control, then that's awesome! Ooh! Thanks for the hat-tip. The only problem I see with switching our lingo to FAM is that many people who use the secular version of FAM utilize barrier methods during fertile times. Ultimately, their birth control is then whichever barrier method they choose, and their "effectiveness" is that of said method. That's why effectiveness studies listing FAM can be so skewed, with failure rates well above actual NFP studies. That being said, Creighton Model is a great example of trying to move away from "NFP". I can't tell you how awkward it is to use words like "FertiliCare" and "NaPro Technology" w/o sounding like a saleswoman. But, truth is, people are intrigued by those words, and repelled by the old lingo...Anyway, novel over. Oh Caitlin, you're one of the most down-to-earth, practical and genuine women I know--it'd take more that a little fertilicare to make you sound like a saleswoman. :) And, silly me, I didn't realize the whole thing with "barrier methods during fertile times" was a thing. I just *expected* people were abstaining. With that in mind, I think you're totally right-on about promoting the new Creighton-associated words which engender much more curiosity (and science-seekers, perhaps) than just "nfp." I had that convo at my OB-Gyn's not long ago. I think I just said "NFP" with the briefest of explanations. The nurse was super respectful but she said " . . . uhm, I'll put down "rhythm method," (I think she was picking options from a drop-down list on her laptop). Okay whatever . . . But she also said, "You know, my cycles are regular, I wouldn't mind doing that. But I couldn't trust my husband." Awkward! !